This multimedia book is compatible with iBooks 2 e-reading app on the Apple iPad and Amazon Kindle ereaders and tablets. View the fullsize cover image here. Every year in July, opera and classical music lovers around the world find their way to a remote town in northern Europe. The town is called Savonlinna, located in Finland, and the reason why they travel there is the annual Opera Festival arranged in the medieval Olavinlinna castle. In addition to enjoying opera performances, visitors have a great opportunity to see the sights of Savonlinna and explore the region: the eastern corner of Finland, next to the Russian border. 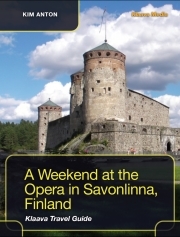 This book shows you the key sights, places to visit and things to do in Savonlinna and in nearby towns. The number one sight is the castle that turns into an opera stage at night, but many of the attractions in the region are related to nature. The book provides a visual tour in the destination, making it easy to learn about the region, decide where to visit, what to do, and where to stay. The book is compatible with the Apple iPad tablet and Amazon Kindle ereaders and tablets. View sample pages on your iPad. Download a sample chapter on your Kindle. Download the book from Apple iBookstore onto your iPad.